Enjoy a day trip around the Island of Kos in our air conditioned Busses and offer yourself the opportunity to explore the island and admire the beauty of its countryside. 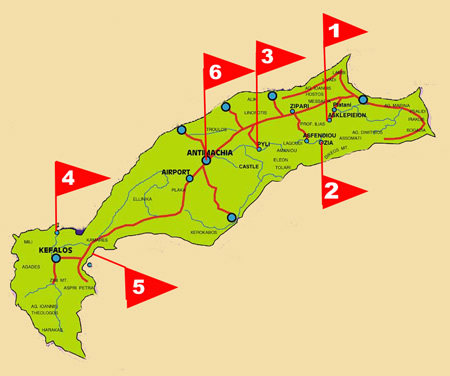 Guided by professionals you will visit the famous Asklepieion, 1 the first hospital of the scientific medicine, and the whole island with its lovely villages, amazing landscape and beautiful sandy beaches. You will admire the superb views from Zia 2 of Mount Dikeos, walk through the narrow streets among the little houses, see the water-mill and the small church, gather some leaves of basil, thyme & menthe and browse in the shops for a hand-crafted souvenir as a lasting keepsake. Later you will be able to ease your thirst at the spring of Pyli, and 3 have a look to Kardamena resort. Lunch will be served in a very nice tavern on one of the most beautiful sandy beaches of Kos 4 and may enjoy a refreshing swim in the crystal waters. After the lunch we visit the village of Kefalos and we enjoy the panoramic view of the Kamari Bay 5 . The Wind-mill and the Traditional House of Antimachia 6 village by the Airport of Kos will be the last stop before returning to your hotel at about 17:00 hours.